The Lok Sabha Polls are approaching fast, with this, politicians are doing whatever they can to attract everyone to vote for them. This time, it is not a promise, but it’s how Kuppalji Devadoss paid for his election security deposit. 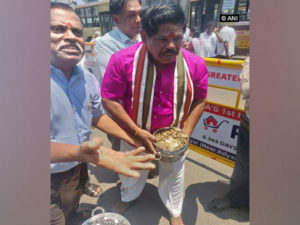 On Monday, Kuppalji Devadoss, an independent candidate from the AMNP (Amma Makkal National Party) came with kitchen utensils that were full with coins that were worth Rs. 25,000 which he used to pay for his election security deposit. He gathered coins of Rs. 1, Rs. 2, Rs. 5, and Rs. 10 to reach the Rs. 25,000 mark. Kuppalji Devadoss went to the South Chennai Zonal Office 13 with containers that were filled with coins that he submitted along with his nomination. The seat that Kuppalji Devadoss is running for is currently held by Radhakrishnan from the AIADMK’s T.
On April 18, 2019, Tamil Nadu with its 39 parliamentary constituencies will go to polls. The counting of the votes will start on May 23, 2019.